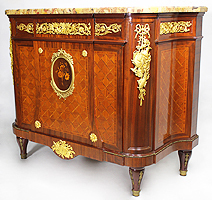 A Very Fine French 19th Century Louis XVI Style Belle Epoque Ormolu-Mounted Kingwood, Satinwood and Mahogany Parquetry and Marquetry Demilune Commode with a Brèche d'Alep marble top, attributed to François Linke (1855-1946). 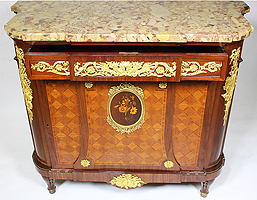 The single front parquetry decorated door centred with a floral and a bee marquetry plaque framed with a floral ormolu mount, the corners with gilt bronze decorations allegorical to music, urns, acanthus and ribbons. 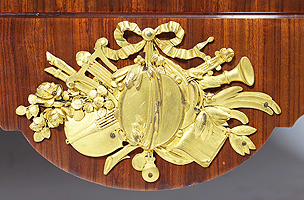 The apron drawer centred with an ormolu mask among floral cornucopias and floral motifs, raised on four fluted legs with gilt bronze caps. Circa: Paris, 1890-1900. François Linke (d. 1946) was awarded the gold medal for his Grand Bureau at the 1900 Paris Exposition Universelle. He was the most celebrated Ebeniste of his time. Born in Bohemia in 1855, he moved to Paris in 1881. 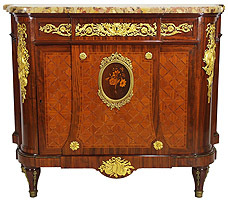 He produced furniture of the highest quality at his workshops at 170, rue du Faubourg-Saint-Antoine, and established showrooms at 26, Place Vendome. 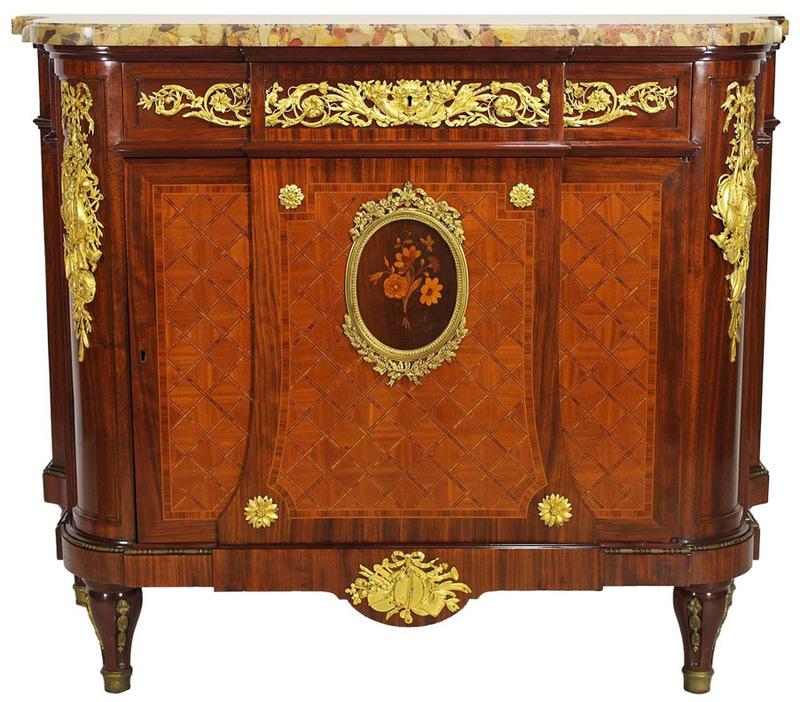 A Very Fine French 19th Century Louis XVI Style Belle Epoque Ormolu-Mounted Kingwood, Satinwood and Mahogany Parquetry and Marquetry Demilune Commode with a Brèche d'Alep marble top, attributed to François Linke (1855-1946). 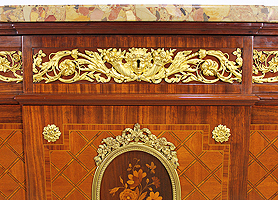 The single front parquetry decorated door centred with a floral and a bee marquetry plaque framed with a floral ormolu mount, the corners with gilt bronze decorations allegorical to music, urns, acanthus and ribbons. The apron drawer centred with an ormolu mask among floral cornucopias and floral motifs, raised on four fluted legs with gilt bronze caps. Circa: Paris, 1890-1900. François Linke (d. 1946) was awarded the gold medal for his Grand Bureau at the 1900 Paris Exposition Universelle. He was the most celebrated Ébéniste of his time. Born in Bohemia in 1855, he moved to Paris in 1881. 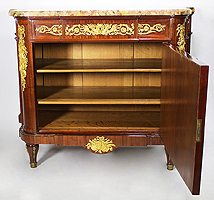 He produced furniture of the highest quality at his workshops at 170, rue du Faubourg-Saint-Antoine, and established showrooms at 26, Place Vendôme.